At OMNIKAL, we’re building wealth in communities through entrepreneurship for all people. While the Inclusive Majority has become a force to be reckoned with, our position on Inclusion stems from a bigger purpose and meaning. One with origins in historical facts, while also reflecting the critical thoughts on the minds of all forward thinking Americans today. Our authentic purpose is to create solutions for all segments of our society collectively, not just individually. In today’s corporate environment, the spotlight and resources are being focused on Diversity & Inclusion (commonly referred to as D&I). In the last decade, we have seen a new industry of professionals emerge that execute the goals of their organization’s D&I initiatives. While diversity and inclusion have been defined to represent 2 different things, each with it’s own set of goals, the industry treats them separately, but connected. The fundamental goal defined by all organizations is to have an inclusive workforce and supply chain that values differences and reflects the communities and customers they serve. These differences currently acknowledge ethnicity, gender, sexual orientation and many other targeted groups. Almost all organizations publicly declare that their culture values diversity and that inclusion is part of their DNA. It’s become cliche to do so. We watch one brand after another racing to create new strategy and positioning to reflect inclusion and turn the battleship around toward the future. But this is where the illusion of inclusion resides and why the real, true meaning of inclusion is our core value at OMNIKAL. First, where did this word “Diversity” come from anyway? Over the last 25 years, the word Diversity has been a “codeword” that was created and applied to the corporate workforce composition. The word was chosen to describe and soften the harsh realities of the quotas and goals of Equal Employment Opportunity Commission (EEOC) and Affirmative Action (AA) programs that began way back in the era of the 1960’s. Due to the derogatory language that developed from EEOC and AA, these programs were condemned, eliminated and in some cases deemed illegal, despite the fact that in less than a decade, a black middle class was created as a result of educational opportunities obtained through AA. The word diversity replaced the word minority and was chosen to reference group categories that represent ethnicity, gender, sexual orientation and other targeted groups. Many people today deeply resent this outdated terminology and level of thinking. The real truth is, it only serves to label and divide us into silos and segments. Instead of acknowledging us all for who we really are…a world of human beings. One people. And what people want is simple; to be included, to celebrate our differences and be seen for the quality of contributions we bring to the table as a result of a new focus on our unique strengths. We believe that in the year 2016, it’s time to evolve the words we use to describe a new level of thinking. Because together, we are the Inclusive Majority. Everyone will surely debate the reasons why these initiatives made most people skeptical of their success and resentful for their implementation. America was just not ready for– nor wanted– Inclusion! Not economically, socially or in any other way. We simply just have to accept the fact that the confusion over equality really had nothing to do with equity or unity. The real problem is …The country is changing and evolving faster than outmoded code words will be able to contain for much longer. In fact, it’s over for the old majority because what we now call The Inclusive Majority has already arrived! They represent everyone in our economic growth engine, our entrepreneurs, workforce, leadership, supply chains, communities, families and customers. While the economic distribution is still not yet balanced, markets, employees and business owners can not be taken for granted. The evolving demographics of today changes everything. What are we actually doing to evolve from this old paradigm? Their struggle is, they are still trying to solve yesterday’s problems driven by yesterday’s agendas that have little or nothing to do with today’s reality or the problems we need to solve. Stuck with the code word ‘diversity,’ using outdated terminology, no thought is given to why ‘diversity’ doesn’t work anymore or who it offends. Organizations see inclusion as the new bright shiny badge of honor and are racing to claim their title of participation in the inclusion club. Yet they keep thinking they can train their way into inclusion, but training doesn’t work. It never worked and never will because you can’t train me to like you. It’s illogical! But organizations continue to use it as a way of showing “good faith effort.” Truth be told, they secretly know that Joe is not going to think differently about Maria, but they stand on the claim that they did something about it, so they can declare mission accomplished. There’s a big problem with that and it’s biting them back. That “problem” is the new marshall in town, and his/her domain is digital transparency. My dad would always say to me “You can fool some of the people some of the time but you can’t fool all of the people all of the time.” In today’s world, that’s called digital transparency; you must walk the talk or pay the price. Social media is the new marshall that takes freedom of speech to a whole new level. And the conversations are transparent and growing. Two stories of companies come to mind of examples of what i call the facade of victory. I’ll share these with you from my own experience. First, Major League Baseball. I once had a discussion with their Chief Diversity Officer about my personal experience with the New York Yankees (MLB was a client at the time). What I explained was the fact that 100% of the food service staff at the stadium was black. I then began expressing my feelings about this and how it creates the perception of black people in general as servants. I explained to him about what my boys felt when I would take them to the games and everyone that looked like them was a servant. I also expressed concern how 95% of the other white fans must have felt about blacks, particularly the kids. Now for those that do not know it, Yankee Stadium is in the Bronx. Which is the most ‘diverse’ neighborhood on the planet so there was no excuse for it! It looked like blatant racism, making black people be viewed as inferior (another elephant in the room!). We stopped going to games after a few years because of this. Yet do you think this has changed? Second, is McDonalds. I recognize that over the years, McDonald’s (MCD) has built a diverse and inclusive corporate culture which has transcended into opening up a number of opportunities (business development, employment, and community outreach) throughout the multicultural marketplace. All of which, I respect and commend. In lieu of this spirit of inclusiveness, I am quite concerned that there may be a disconnect in truly reinforcing this culture when it comes to hiring processes in their restaurants. Have you noticed that in many McDonald’s locations, you will see a representation of only one ethnic group being employed in a marketplace that has many ethnic groups? In one location you may just see just Hispanics employed or in another, just African Americans. McDonald’s continues to have segregated workforce throughout all their locations in the U.S. Despite the fact that McDonald’s had had an African American CEO at its helm, it still doesn’t move away from the issue that their employees are sometimes kept separate by ethnicity. Just reflecting upon the fact where we see an increasing intermingle of all diverse groups throughout our communities, why wouldn’t each McDonald’s location also represent this vast mix of cultures instead of one? We can’t blame the franchisee, as it truly has to come from MCD to be implemented throughout the hierarchy’s culture. Organizations continue to grow, birth forth creative ideas, and truly understand their marketplace by hiring those who reflect their entire market. We want to see McDonald’s succeed as a leading example for other organizations and to take the next steps and make the necessary changes so that segregation is never a factor but inclusiveness of all cultures is. So I end with a reflection question…does anyone else observes these hiring practices like McDonald’s? My curiosity begs to question, why do we continue to ignore the facade? What’s really driving unconscious bias? To understand one of the fundamental reasons why we unconsciously create bias, one has to look first at the way we are wired. The human brain was designed to be a categorizing and label making machine. This fact alone gives all the clues we need to see why we never seem to stop unconsciously creating more and more silos, segments and labels out of people. We’ve even given the generations their labels of Gen X, Y & Z… next up, religious segments? When are we going to SEE what this is really doing to further create a divide? What is the real cause and effect? What it is cutting us off from? The only thing that belongs in a silo is grain or a missile. And who really wants to be referred to as a label? In the case of Gen X and Y. It’s amazes me all the talk that continues about figuring out what “we” are going to do with the millennials. The truth is, millennials aren’t the problem. They are in charge now. 36-year-olds and under are most of middle management and within 3-4 more years will also become our next senior executives. 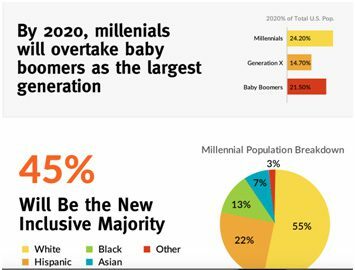 The funny thing is, the ones doing the talking aren’t realizing that the real conversation is about what the heck are millennials going to do with YOU! The new paradigm of inclusion is one that is steeped in individual contribution and value of humans as people without labels. Inclusion is seeing everyone as human and focuses only on the strengths and contributions capable of each individual. Period. No labels. No silos needed. Just the truth: people whose real strengths and potential being fully expressed and utilized as a contribution. If we continue to believe diversity is balancing all group’s participation as the gold standard, we will hit the same brick wall and continue to score an F on the next report card. It’s very obvious now how our country thinks about diversity and inclusion and it doesn’t look to good for the home team. If we think in terms of making as many people as possible to believe and accept inclusion, there has to be something in it for the “OWGN,” whom we traditionally think of that needs “training.” And, here is where it gets complicated. The codes were created by the OWGN and now we have programs (D&I) to educate and train the OWGN, who created these codes. Budgets have been provided by the same groups (those in charge) that need to understand inclusion. We never train the targeted groups to understand the OWGN, that needs to understand themselves. It’s a hell of a circle jerk that no wonder has gone nowhere! Things that are important always get done in big companies and really fast. But who is in charge of things that are important? Let’s look. Why is it that nearly 80% of D&I professionals are African American and the rest are mostly white women (in HR)? Why is it that we lack equally paid women in C suite positions? Facing realities is never easy. Inclusion is way more important than C-suite executives are actually understanding, despite all the obvious indicators in markets as to why this should matter. So why do D&I professionals continue to take the positions in their companies that white guys don’t want? Who is going to tell the C-suite thev’e created a ghetto in their organizations? Let’s call a spade a spade…It’s the only functional department in the company that clearly targets African Americans to manage. More importantly, I suggest black folks stop taking these positions. It’s clearly insulting and callous. At this point, it would be very easy for me to lay out a lot of generally accepted practices or to continue with business as usual. But that’s not what OMNIKAL is about. I founded OMNIKAL because we believe in creating real solutions for real world problems. For us, it’s about the bigger picture. We look at the largest economic engine on the planet: entrepreneurship. We recognize that the more we fuel this engine, the more we serve our cause of fueling growth for all entrepreneurs by contributing to the Triple Bottom Business Model through people, planet and profit. It is and always will be about the greater purpose the ripple effect has on our nation and the global marketplace. We say if you want to be part of the solution….start your own business or support small to medium companies make their come up. When it comes to entrepreneurship and helping small to medium business enterprises to truly grow and thrive, it takes the right foundation to support this engine for real economic growth and impact. SMBs face a myriad of challenges from funding, learning, training, mentorship and making the right key connections that become the success pipeline of the business. We’re doing more than any social business platform or business organization to serve all entrepreneurs and companies to make their come up. We’ve made the art of making valuable business connections, mentorship, training and programs easy, affordable and inclusive instead of exclusive, expensive and frustrating. Inclusion is not a label or a scorecard. If you make my day better, help our team meet its goals, help grow the business, you’re my man. It’s not about any one group being preferred, creating resentment or burdening anyone.